They're painted! Over the weekend, I slapped some navy blue paint on my little Craigslist nesting tables finds. And now, the tables have a proud new home in my living room, holding Nana's lamp. Here's one more big picture shot without the bright lamp on. Here's one more daylight shot! **Um, PS. It's Wednesday. But I thought I'd leave up what I originally wrote at 6:15 this morning, because it's kind of funny. My brain is fried. Halfway through the week, yessss. The navy blue looks great on those tables and I love the way they look between the chairs and contrasted up against the yellow rug! You did well, girl! They look great - like they were made for that spot! and thank god it's wed not tues!! fantastic!!! Love the navy paint! I am so glad you went blue! 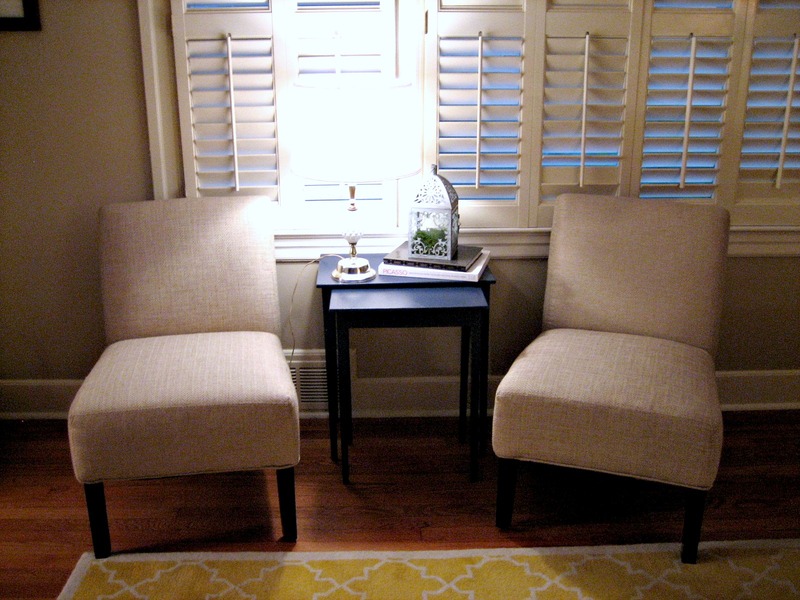 They are perfect, now you just need some throw pillows for those chairs! Great job! I love the navy blue color. They fit the space perfectly. haha...So glad you were wrong about the day of the week! I might cry if it was only Tuesday! Love the nesting tables and love the new color! Very nice! Adorable! Where did the rug and chairs come from, by the way? they look fabulous! i love the dark color! get some rest tonight! Looks way fab!! I love the traditional feel to it! You remind me a lot of Dana with your decorating and colors! These look great. I love them in navy. The Tuesday comment made me laugh because I entitled yesterday's goals post "January goals" Where the heck have I been? Your tables look great in the navy. A perfect spot in your house for them, too! I also love your rug. There is a versatile blogger award for you on my blog if you're interested! What a transformation! The navy blue is so sleek and classy. Perfect with the rug! Great buy and transformation! Fits the room and lamp perfectly! 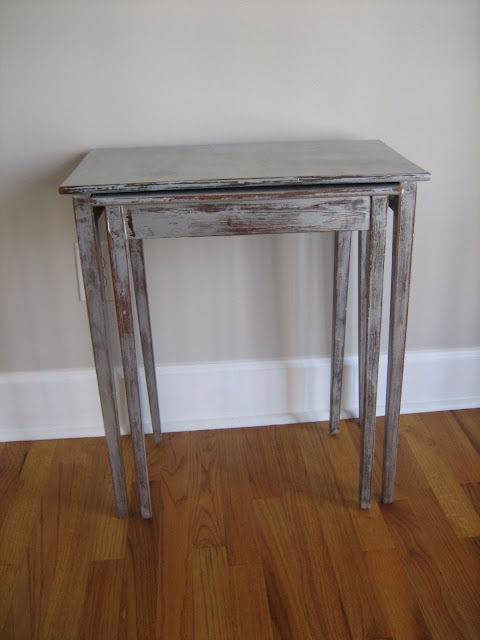 I have a major thing for nesting tables, and yours are great! I love the color you chose, it goes so well in your room! 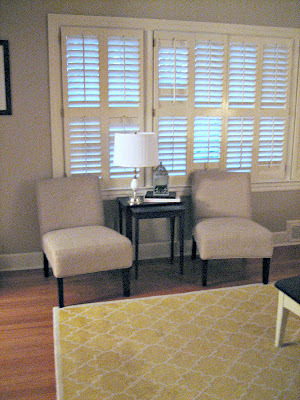 The navy tables look great with that rug! Love the color combo! Thanks for visiting my blog! I've been dreaming of painting and sprucing up some craigslist finds but am struggling to convince my husband to trust me...perhaps showing him your awesome before and afters will help! wow! I never would have KNOWN they're the same tables! Awesome job! Nothing better than having a nice little set of nesting tables! Comes in handy when having friends and family over. Hi Michelle! I am here for the first time and I'm in love! You are so creative. I can't wait for the weekend so that I can have more time to look at prior posts! I look forward to the future ones! Have a great weekend. Michelle, LOVE your blog... EVERYTHING about it. Thanks for sharing your ideas and finished products. It's all such inspiration. LOVE these tables (and the parsons chairs they're sitting between)! Love those tables and they look great with the chairs! New follower from Serenity Now! Can't wait to see what other creative things you do! Those look great! Love the navy with the yellow rug. And your grandma's lamp looks like it was meant to sit on that table! High five! Love the navy...so much better than the shabby look. Turned out amazing. Don't forget to join me for More The Merrier Monday and link up all of your great projects. Oh, so, so much better "After." I love the new look. :) Very sleek and modern, but with a soft touch. Your room looks amazing!! It's amazing how a coat of paint can transform anything. The tables and your seating area decor look great together. I also love your yellow rug! Can you tell me where you got it? great paint job. I love the rug and pillow too. What a fantastic vignette! 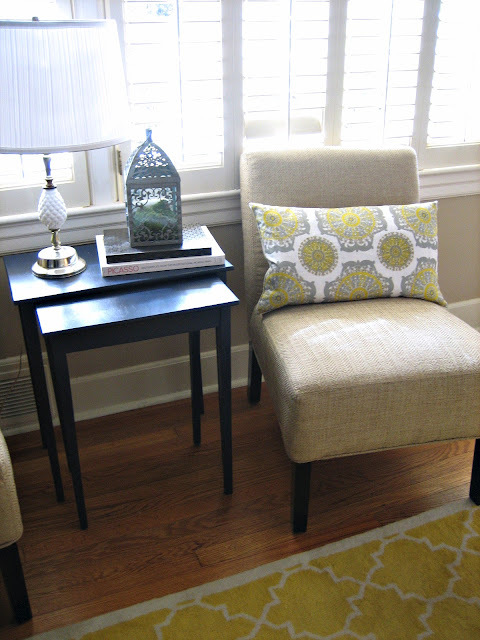 I love your table in navy- it looks so great with the yellow rug! Your chairs are fabulous too! Great styling!! Beautiful!!! and that rug!!!!! Oh my gosh!! Is that the one from Pottery Barn? Its beautiful!! Great makeover. LOVE the rug. where did you get it?